I did something really weird. I decorated Preston's closet. Maybe that's not actually that weird, but it does seem silly to decorate a closet when you think about it! We had several sweet decorative items or special keepsakes that were given to us that didn't have a good spot in the nursery, so I decided to make a sweet little whimsical closet space. I actually quite love his little closet! 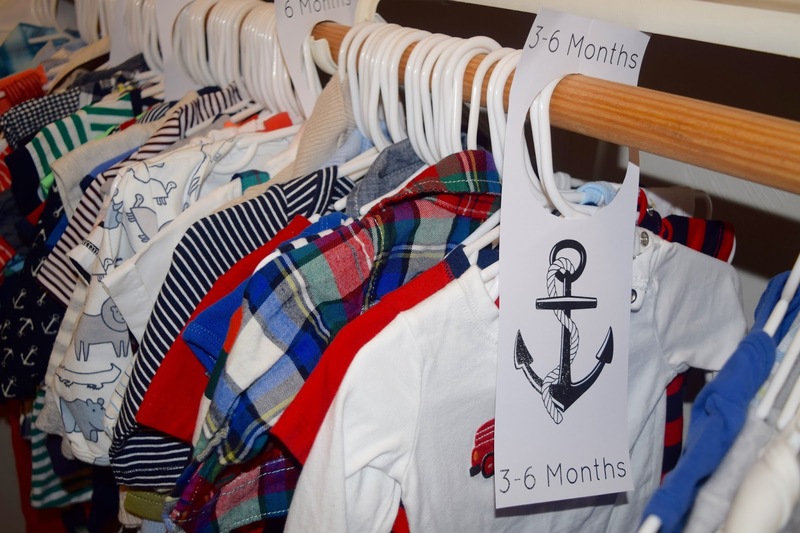 I shared some of the details of the nursery last week, so today, here is a look inside little man's closet. The adorable banner was made by my mother in law for my baby shower. It perfectly matches the nursery color scheme we decided on! 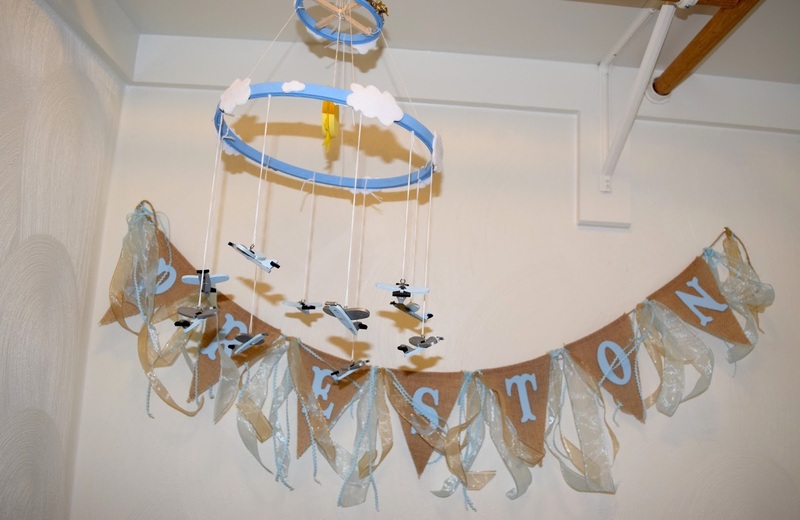 The mobile was made by my super talented friend for my other baby shower. 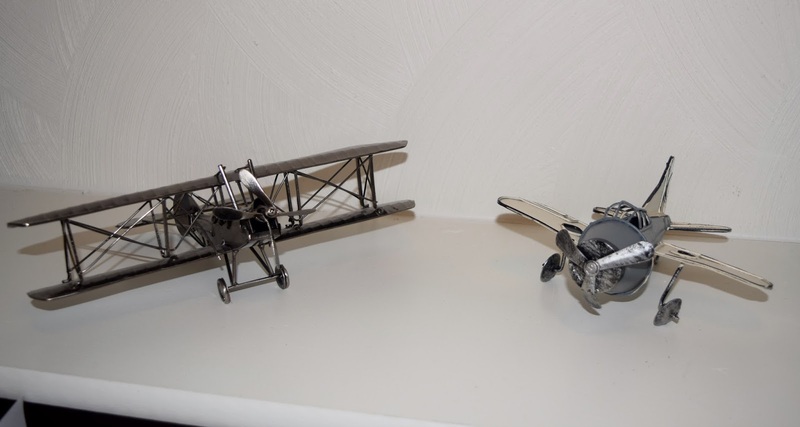 I love the little airplanes! Here's a closer look at the mobile. It hangs at the top of the closet and is so fun to see when I open his closet every morning. I didn't need much shelving space (I am sure that will change as he grows and accumulates more things! 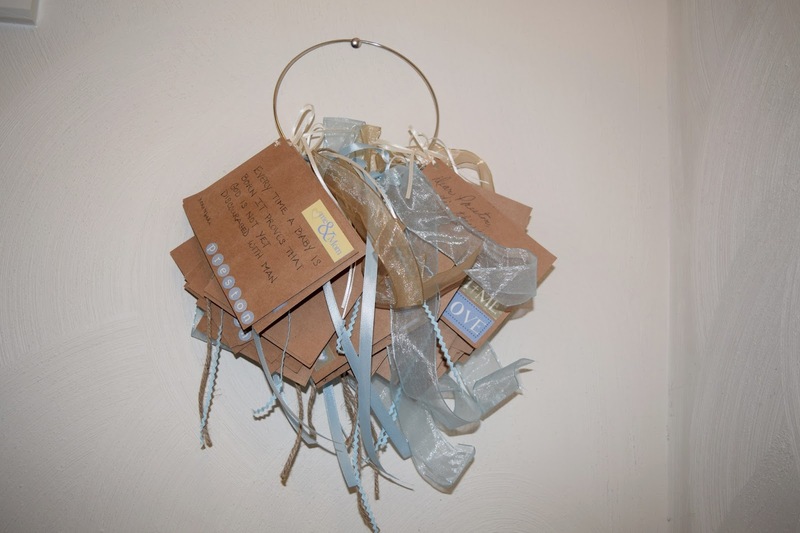 ), so I used his shelves to hold some fun keepsakes. 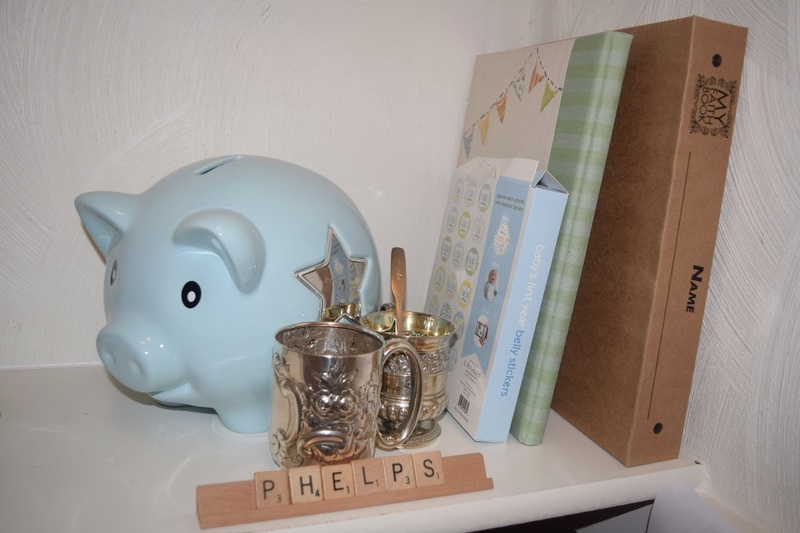 The piggy bank has his name engraved on the side, and the scrabble tiles are a gift from my mother-in-law. The silver cups are antiques that my Nana gifted us. One was actually given to me for Taylor Grace, and the other is for Preston. Preston's also has a silver spoon in it that was given to us from Parker's squadron. That will be what Preston eats his first bite of food from in a few months! 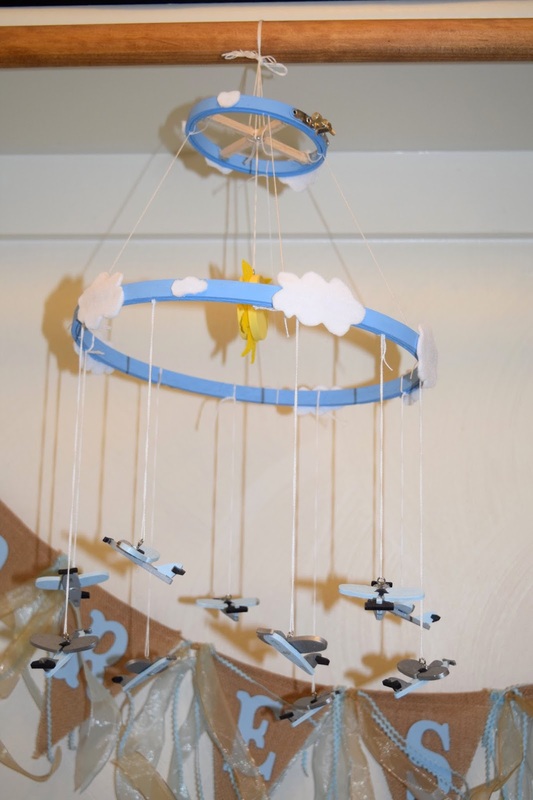 I was originally planning on doing an airplane-themed nursery, but when Parker and I decided we just wanted 1-2 airplanes in the nursery to keep things simple, these became closet decorations. I love the vintage feel! This is called a ring of blessings. My mother in law made it for my baby shower, and our friends and family wrote little prayers or wishes on the cards for baby Preston. It is so special, and I can't wait to read it to him one day. 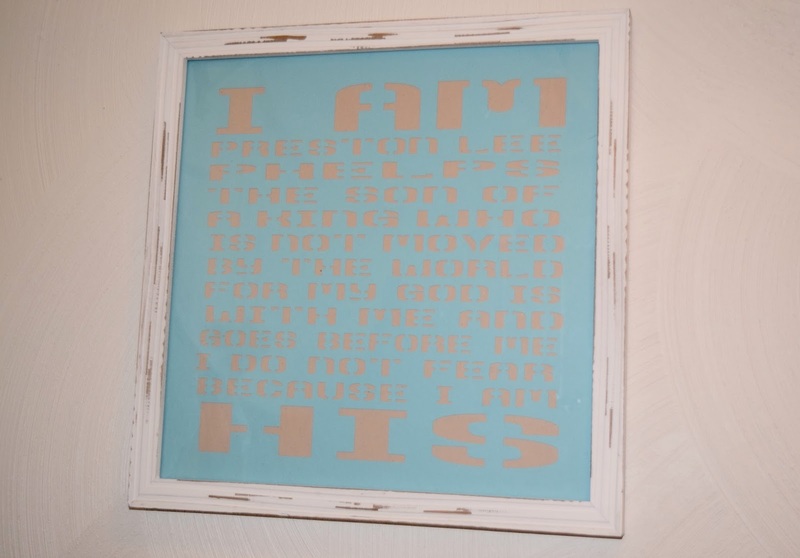 This was a gift as well, and I love that it is personalized for baby Preston. I made these little clothing dividers on the computer and cut them out (cheap, party of one). They have been great for separating his clothing by size. They were so easy to make on the spot too! What a cute idea! Love this!! The mobile is so so cute! :) I love the planes. So cute! I have been wanting to re-organize mine and Andy's closets so badly, but there's no point with the move coming up so soon! I haven't bothered to switch out my summer and winter clothes yet either for the same reason!